Nationality: Noun — Belarusian(s). Adjective — Belarusian. Population (Nov. 1, 2011): 9,466,700 (urban 75%; rural 25%). Population decline (2011 est. ): -0.152%. Ethnic groups (2009 census): Belarusian (83.7%), Russian (8.3%), Polish (3.1%), Ukrainian (1.7%), Jewish (0.14%), other (3%). Religions (2010 est. ): Eastern Orthodox 82.5%, Catholic 12%, Protestant 2%, other (including Autocephalous Orthodox, Jewish, Muslim, and Krishna) 3.5%. Health: Infant mortality rate (2011 est.) — 3.6/1,000. Life expectancy (2011 est.) — 71.2 years (men 65.57 years, women 77.18 years). Judicial: Constitutional Court, Supreme Court, and Supreme Economic Court. 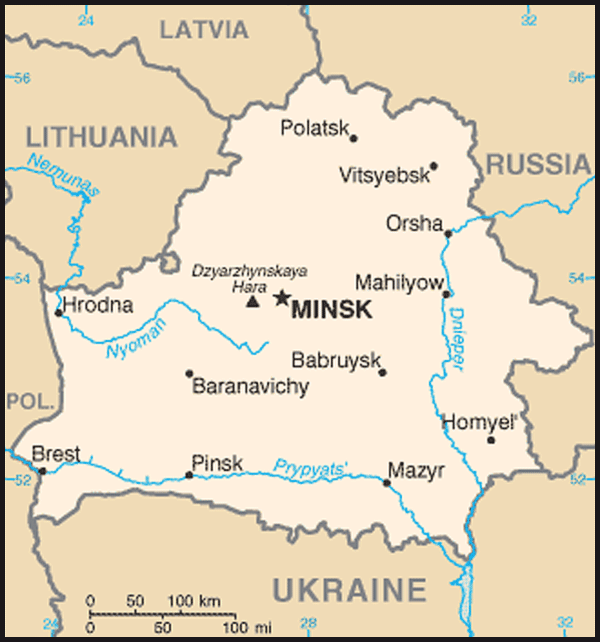 Administrative subdivisions: Six oblasts (regions) and one city with special administrative status (Minsk). Political parties: Belarus has 15 registered political parties, including Belarusian Agrarian Party (BAP); Belarusian Party "The Green" (BPG); Belarusian Social and Sports Party (BSSP); Belarusian Patriotic Party (BPP); Belarusian Popular Front (BNF); Conservative Christian Party-BNF; Social-Democratic Hramada Party (SDH); Belarusian Social-Democratic Party (Hramada); Social Democratic Party of Popular Accord (SDPPA); Communist Party of Belarus (CPB); Belarusian Party of the Left "Just World" (BPLJW); United Civic Party (UCP); Liberal Democratic Party (LDP); Republican Party (RP); Republican Party of Labor and Justice (RPPS). Several of these parties exist in name only. Other, unregistered parties are also active, such as the Belarusian Christian Democracy and Belarusian Party of Workers. GDP (2011 est., purchasing power parity (PPP): $140.73 billion. GDP real growth rate (2011): 5.3%. Per capita GDP (2010 World Bank est., PPP): $13,928. The Belarusian ruble suffered a three-fold devaluation in 2011, thus likely reducing PPP estimates. Natural resources: Forest land, peat deposits, potash, small amounts of oil and natural gas. Agriculture: Products: grain, potatoes, vegetables, sugar beets, flax, beef, pork, milk. Industry: Types: metal-cutting machine tools, tractors, trucks, earthmovers, motorcycles, televisions, synthetic fibers, fertilizer, textiles, radios, refrigerators. Trade (January-November 2011): Commodity exports — $36.5 billion (refined petroleum, potash fertilizers, machinery and transport equipment, chemicals, food products, metals, and textiles). Major markets — Russia, Germany, Netherlands, Poland, Great Britain, Ukraine, and Latvia. Commodity imports — $41.3 billion (mineral products, machinery and equipment, metals, crude oil and natural gas, chemicals, foodstuffs). Major suppliers — Russia, Germany, Ukraine, Poland, Italy, Lithuania, China. Exchange rate (January 2012): 8,460 BYR (Belarusian rubles) = U.S. $1. While archeological evidence points to settlement in today's Belarus at least 10,000 years ago, recorded history begins with settlement by Baltic and Slavic tribes in the early centuries A.D. With distinctive features by the ninth century, the emerging Belarusian state was then absorbed by Kievan Rus' in the ninth century. 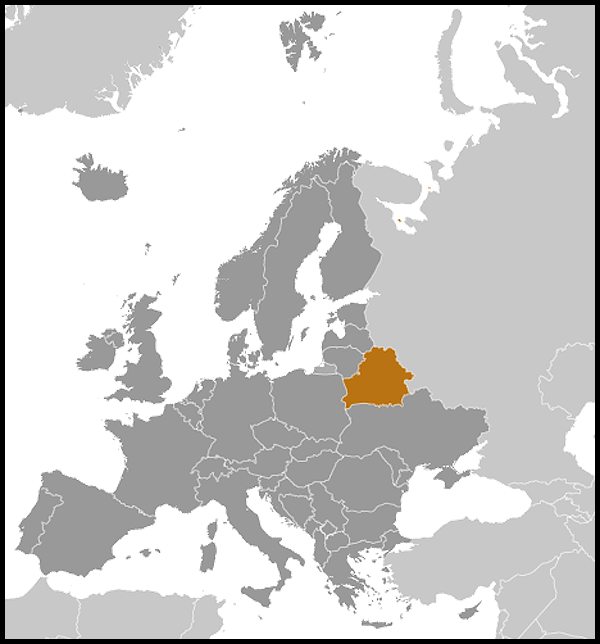 Belarus was later an integral part of what was called Litva, which included today's Belarus as well as today's Lithuania. Belarus was the site of the Union of Brest in 1597, which created the Greek Catholic Church, for long the majority church in Belarus until suppressed by the Russian empire. Occupied by the Russian empire from the end of the 18th century until 1918, Belarus declared its short-lived National Republic on March 25, 1918, only to be forcibly absorbed by the Bolsheviks into what became the Soviet Union (U.S.S.R.). Suffering devastating population losses under Soviet leader Josef Stalin and the German Nazi occupation, including mass executions of 800,000 Jews, Belarus was retaken by the Soviets in 1944. It declared its sovereignty on July 27, 1990, and independence from the Soviet Union on August 25, 1991. It has been run by the authoritarian leader Alyaksandr Lukashenka since 1994. The constitution provides for a directly elected president who serves a 5-year term. The bicameral "parliament", which was formed as a result of a flawed 1996 referendum and which the U.S. Government does not recognize, consists of the 64-seat "Council of the Republic" and the 110-seat "House of Representatives". The "Council of the Republic" is the house of territorial representation. Eight members of the "Council" are appointed directly by the president of the Republic of Belarus, while local regional councils, whose heads are appointed by the president, elect the rest. The deputies to the "House of Representatives" are elected directly by the voters. The president appoints the prime minister, who is the head of government. The system of courts in Belarus is based on the territorial principle and specialization. The president alone appoints 6 of the 12 judges of the Constitutional Court and all the judges of the general jurisdiction and economic courts. The president appoints, with the consent of the Council of the Republic, the Chiefs of the Constitutional Court, the Supreme Court, and the Supreme Economic Court. With the consent of the Council of Republic, the president also appoints the General Prosecutor, the Chairman of the National Bank, and the Chairman of the Central Election Commission. The president alone appoints the head of the State Committee for Security (KGB). Since his election in July 1994, Alyaksandr Lukashenka has consolidated power steadily in the executive branch through authoritarian means, destroying checks and balances and thereby dominating all branches of government. The Organization for Security and Cooperation in Europe's Office for Democratic Institutions and Human Rights (OSCE/ODIHR) monitors have never determined that an election in Belarus meets OSCE standards for free and fair elections. Lukashenka used a non-democratic referendum in November 1996 to amend the 1994 constitution to broaden his powers and illegally extend his term in office. He began to count his 5-year term in 1996, thereby adding 2 years to his first term in office. Based on the unrecognized 1996 constitution, Lukashenka announced that presidential elections were to be held in 2001. In 2004, he engineered a fraudulent referendum that removed term limits on the presidency. Independent exit polling of the referendum showed results far different from those officially announced. OSCE/ODIHR observers reported that the March 19, 2006 presidential election failed to meet international standards, was characterized by a disregard for the basic rights of freedom of assembly, association, and expression, and included a highly problematic vote count. Authorities detained many opposition and civic activists during the campaign and used force against demonstrators protesting the fraudulent election. Opposition presidential candidate Alyaksandr Kazulin was beaten and arrested during post-election protests and sentenced to a 5-year jail term. (The Belarusian authorities released Kazulin on August 16, 2008.) In January 2010, Lukashenka further consolidated his rule through local elections that failed to meet international standards. The December 19, 2010 presidential elections were marked by cosmetic improvements during the campaign, such as limited access to state media and the legalization of limited campaign finance accounts. However, on election night, in reaction to a massive, peaceful protest held in downtown Minsk, the Government of Belarus launched an unprecedented (and still ongoing) crackdown. The crackdown resulted in hundreds of arrests and the imprisonment of seven of the nine opposition presidential candidates. One of the presidential candidates, Uladzimir Nyaklayeau, was brutally beaten before the polls closed on election night, then abducted by unknown individuals from his hospital bed. Lukashenka declared himself the victor of the 2010 presidential election, claiming 80% of the vote. However, the vote count was declared by the OSCE/ODIHR election monitoring mission to have been "bad and very bad in almost half of all observed polling stations." Consequently, the United States Government does not recognize these results as legitimate. The United States considers the more than 50 persons imprisoned or suffering from restrictions on their freedom imposed by the Government of Belarus to be political prisoners. Eight of these individuals, including presidential candidates Mikola Statkevich and Andrei Sannikau, remain in prison. There are credible reports of mistreatment, including hindering access to legal counsel and relatives. In October 2000, "parliamentary" elections occurred for the first time since the disputed referendum of 1996 that dissolved the unicameral parliament and created a bicameral system. According to the OSCE/ODIHR, these elections failed to meet international democratic standards. International monitors noted sweeping human rights violations and undemocratic practices throughout the election period, including massive vote-counting fraud. These irregularities led the OSCE/ODIHR to find that these elections failed to meet Belarus' OSCE commitments for democratic elections. The March 2003 local elections and October 2004 "parliamentary" elections also failed to meet international standards of freedom and fairness. OSCE/ODIHR observers declared that the "parliamentary" elections fell far short of international standards, citing abuses in the campaign period and the vote counting. Belarus held "parliamentary" elections in late September 2008. Despite Belarusian authorities' public assurances that the elections would be "unprecedentedly" democratic and transparent, the OSCE/ODIHR election observation mission determined the elections fell short of OSCE standards. The authorities denied registration for approximately 20% of opposition candidates as well as candidates overall. While candidates were allotted their mandatory campaign airtime on various media outlets, restrictions on this access made it difficult for candidates to adequately present their platforms to the public. OSCE/ODIHR observers noted good access to polling stations during early voting and on election day. However, the Belarusian authorities fell short on access for OSCE/ODIHR and other observers to the vote count, a crucial aspect for determining the transparency of the elections. OSCE/ODIHR observers assessed transparency of the vote count to have been bad or very bad in 48% of observed cases. The OSCE recognized minor improvements in the conduct of the elections, but the lack of a transparent vote count made it impossible to determine the validity of the elections. The Department of State issued a statement following OSCE/ODIHR's preliminary assessment, expressing disappointment with the failure of the Belarusian elections to meet international standards. The next "parliamentary" elections are to take place no later than September 2012. Although the constitution provides for basic rights and the rule of law, in practice the Government of Belarus has not always respected this. Freedom of Expression. Already tight government restrictions on basic freedoms worsened during the crackdown following the 2010 election. Efforts to infringe upon press freedoms have included the misuse of libel laws, increased restrictions on foreign funding, continuing pressure on businesses not to advertise with independent media, limitations on access to newsprint and printing presses, prohibiting access to state distribution networks, censorship, restrictions on the import of media-related materials, temporary and permanent suspension of independent and opposition periodicals, confiscation in quantity of printed publications, and detention of those distributing such material. Despite constitutional provisions, a 1998 government decree limited citizens' rights to express their own opinions. All Internet service providers in Belarus operate through a state-controlled portal, and a presidential decree restricting Internet use came into effect July 1, 2010. The Government of Belarus has continued to make use of its monopoly on television broadcasting to present biased news coverage and to minimize the presentation of opposing points of view. Freedom of Assembly and Association. Both the 1994 and 1996 constitutions provide for freedom of peaceful assembly. However, the regime severely restricts this right in practice, and amendments passed in 2011 further restrict this right. For example, organizers cannot advertise an event until they receive official permission, which is rarely granted to opposition groups. Moreover, demonstrations require an application at least 15 days in advance of the event, and the local government must then respond positively or negatively at least 5 days prior to the event. Police and other security officials have detained, harassed, and beaten demonstration participants, opposition candidates, and, at times, their families after demonstrations, irrespective of their legal status. Police film all demonstrations, including sanctioned events. Freedom of association is severely restricted by applying stringent registration requirements to political parties, trade unions, non-governmental associations and other organizations of civil society, which are required to register with the Ministry of Justice. Many organizations were unable to register and refused on minor technicalities. The Belarusian Christian Democracy party was refused registration three times, and a leading human rights group, Vyasna-96, has been unable to register for years after having been de-registered by the government. Individuals working for unregistered organizations can face up to 2 years of imprisonment. Ales Byalyatski, head of Vyasna-96, was tried, convicted, and sentenced by the Government of Belarus to 4-1/2 years of imprisonment in 2011 on trumped-up charges of tax evasion. Freedom of Movement. On December 17, 2007, Lukashenka abolished exit stamps in favor of a computerized system that verifies the validity of passports. At the same time, however, he authorized the Interior Ministry to ban travel by individuals who had access to state secrets, who were facing criminal prosecution or civil suits, and who had outstanding financial commitments. The travel ban list allegedly has 100,000 names. Several opposition leaders and activists are subject to this travel ban and have been prevented from temporary travel abroad. In the wake of the December 2010 crackdown, some political prisoners who received suspended sentences have had travel restrictions placed on them; this includes both travel in Belarus and abroad and on occasion it also has been extended to their family members. Labor Rights. The constitution provides for the right of workers, except for state security and military personnel, to voluntarily form and join independent unions and to carry out actions in defense of workers' rights, including the right to strike. In practice, however, these rights are limited. No independent unions have been established since 1999. The Belarusian Free Trade Union (FTUB) was established in 1991 and registered in 1992. Following the 1995 Minsk metro workers strike, the President suspended its activities. In 1996, FTUB leaders formed a new umbrella organization, the Belarusian Congress of Democratic Trade Unions (BCDTU), which encompasses four leading independent trade unions and is reported to have about 10,000 members. Membership has steadily declined under Government of Belarus harassment and pressure. In June 2000, a complaint was lodged with the International Labor Organization (ILO) by several trade union organizations alleging the government was attempting to destroy the independent unions. A campaign was carried out to raise international awareness about trade unions and to put pressure on the Belarusian authorities. Late in 2001, the regime attempted to further restrict the unions by refusing to turn over dues paid by members. Once it became clear that the unions and the semi-official Federation of Trade Unions of Belarus (FTUB) were adjusting to this change, the government embarked on a takeover of the FTUB and several of its branch unions in July 2002. The FTUB subsequently became an arm of the government after the election of the government nominee, Leonid Kozik, to the position of Chairman of the FTUB. In November 2003, the ILO approved the establishment of a Commission of Inquiry to investigate alleged serious violations of workers' rights in the country. That same month the Ministry of the Economy informed the ILO that all activities related to its technical assistance project to labor unions must cease because registration of the project was denied. In 2004, the ILO presented the government with a list of 12 recommendations to improve its treatment of independent unions. A January 2006 ILO mission found that the government had not implemented any of these recommendations. As a result, in June 2007, the European Union (EU) suspended Belarus' trading preferences under the Generalized System of Preferences (GSP). The United States had suspended GSP preferences in 2000 due to Belarus' failure to take steps that would allow the right of association and collective bargaining. In March 2004, the government began forcing state employees (some 80% of Belarusian workers) to sign short-term work contracts, one of the main instruments by which the Government of Belarus maintains social control. Although contracts may be concluded for a period of 5 years, most expire after 1 year, which essentially grants the government the opportunity to annually fire anyone in its employ, usually anyone involved in opposition politics or civil protest. Many members of independent unions, political parties, and civil society groups have lost their jobs when their contracts were not renewed. Freedom of Religion. The constitution provides for freedom of religion; however, the authorities have restricted this right in practice. Although Article 16 of the 1996 amended constitution reaffirms the equality of religions and denominations before the law, it also contains restrictive language stipulating that cooperation between the state and religious organizations "is regulated with regard for their influence on the formation of spiritual, cultural, and country traditions of the Belarusian people." The government also restricts religious freedom using the provisions of a 2002 law on religion and a 2003 concordat with the Belarusian Orthodox Church (BOC), a branch of the Russian Orthodox Church (ROC) and the only officially recognized Orthodox denomination. Although there is no state religion, the concordat grants the BOC privileged status. Numerous anti-Semitic acts and attacks on religious monuments and buildings have occurred with little discernable response from the government. Authorities have kept many religious communities waiting as long as several years for decisions about property registration or restitution. Authorities also have harassed and fined members of certain religious groups, especially those that the authorities appear to regard as bearers of foreign cultural influence or as having a political agenda. Foreign missionaries, clergy, and humanitarian workers affiliated with churches have faced many government-imposed obstacles, including deportation and visa refusal or cancellation. The State Department's reports on human rights practices in Belarus are located at (http://www.state.gov/j/drl/rls/hrrpt/). Ambassador to the U.S. — Note: The Government of Belarus recalled its Ambassador in 2008. The Embassy of the Republic of Belarus in the U.S. is located at 1619 New Hampshire Ave., NW, Washington, DC 20009; Main Telephone: 202-986-1604; Fax: 202-986-1805; Consular Section: 202-986-1606; website: http://www.usa.belembassy.org/eng/ (http://www.usa.belembassy.org/eng/). As part of the former Soviet Union, Belarus had a relatively well-developed industrial base. Following the breakup of the U.S.S.R., Belarus retained this industrial base, which is now outdated, energy inefficient, and dependent on subsidized Russian energy and preferential access to Russian markets. The country also has a broad agricultural base that is equally inefficient and dependent on government subsidies, as well as a high education level. However, Belarus remains the only country in Europe with a higher education system that has not acceded to the Bologna Process promoting common European standards. The Government of Belarus has shown little interest in moving toward a free-market system given that the state- run economy provides a key element of social control. After an initial burst of capitalist reform from 1991 to 1994, including privatization of state enterprises, creation of institutions of private property, and development of entrepreneurship, Belarus' economic development has greatly slowed under Lukashenka, and in many cases, reversed its pace of privatization and other market reforms while emphasizing the need for a "socially oriented market economy." About 80% of all industry remains in state hands, and foreign investment has been hindered by a climate hostile to business. A few banks, which had been privatized after independence, were renationalized under Lukashenka, with state banks in 2011 accounting for 75% of the banking sector. Potash, the country's most valuable mineral resource and a major hard currency earner, is sold as fertilizer. According to informal sources, Belarus accounts for more than 16% of world market's potash supply. Belarus also has deposits of clay, sand, chalk, dolomite, phosphorite, and rock and potassium salt. Forests cover about a third of the land, and lumbering is an important occupation. Potatoes, flax, hemp, sugar beets, rye, oats, and wheat are the chief agricultural products. Dairy and beef cattle, pigs, and chickens are raised. Belarus has small reserves of crude oil, though it imports most of its crude oil and natural gas from Russia at prices substantially below world market prices. The main branches of industry produce tractors and trucks, earthmovers for use in construction and mining, metal-cutting machine tools, agricultural equipment, motorcycles, chemicals, fertilizer, textiles, and consumer goods. The chief trading partners are Russia, Germany, Ukraine, Poland, and the Netherlands, though the vast majority of industrial goods go to Russia, with energy exports flowing west. Economic output, which had declined for several years following the collapse of the Soviet Union, revived in the mid-2000s thanks to the boom in oil prices. Belarus exported at market prices refined oil products that were produced from Russian crude oil purchased at a steep discount. The funds from this so-called "oil off-shore" allowed the Government of Belarus to enter into a so-called "social contract" with Belarusians: political passivity in return for a slowly increasing standard of living. However, in late 2006, Russia began a process of rolling back its subsidies on oil and gas to Belarus. In December 2006, after a short-lived dispute, Belarus and Russia agreed on a schedule of graduated price increases toward European market prices for the gas Belarus would receive. Russian gas giant Gazprom also bought a 50% stake in Belarus' pipeline firm Beltransgaz. Under this deal, although Gazprom raised prices for Belarus gas deliveries in 2010, the costs were still less than the price paid by EU member states. Tensions over Russian energy reached a peak in 2010, when Russia stopped the export of all subsidized oil to Belarus save for domestic needs. However, in December 2010, Russia and Belarus again reached a deal to restart the export of discounted oil to Belarus, although the terms were far less favorable than before and increased Belarusian energy dependence on Moscow. In November 2011, Belarus and Russia reached an agreement to drastically reduce the price of natural gas in exchange for Russia gaining full control over Beltransgaz, the natural gas pipeline operator. Due to the economic and political climate, little new foreign investment has occurred in recent years. However, the government publicly claims to support foreign investment and has made various regulatory changes designed to attract investment. Belarus was ranked number 58 in the World Bank's "Doing Business 2010" report and was among the top 10 "reformers" for 2008-2009. In 2011, a financial crisis was triggered by the Government of Belarus raising salaries by over 30% and far ahead of productivity in the run-up to December 2010 elections. This policy was compounded by an increased cost in Russian energy inputs and an overvalued Belarusian ruble and eventually led to a nearly three-fold devaluation of the Belarusian ruble in 2011 and 118.1% year-on-year inflation, leading to a concomitant drop in living standards. The present situation has stabilized in the short term due to a $3 billion, multi-tranche, 3-year loan from the Russian-dominated Eurasian Economic Community (EurAsEC) Bail-out Fund; a $1 billion loan from the Russian state-owned bank Sberbank (terms and duration are not public); and the $2.5 billion sale of Beltranzgas to Russia state-owned Gazprom. Belarus has established ministries of energy, forestry, land reclamation, and water resources, as well as state committees to deal with ecology and safety procedures in the nuclear power industry. Belarus faces growing air, land, and water pollution levels from potash mining in the south of the country. The most serious environmental issue in Belarus results from the April 26, 1986 accident at the Chernobyl nuclear power plant in Ukraine. The massive nuclear accident at Chernobyl had a devastating effect on Belarus. About 70% of the nuclear fallout from the plant landed on Belarusian territory and about 20% of the land remains contaminated. As a result of the radiation released, agriculture in a large part of the country was destroyed and many villages were abandoned. Resettlement and medical costs were substantial and long-term. Many living in Chernobyl-afflicted zones have infrequent access to medical treatment due to remoteness, inadequate equipment, and substantial costs. Although the Belarusian authorities claim otherwise, many radiation monitoring stations, especially in rural areas, are either ill-equipped, poorly staffed, and/or no longer in operation. Resettlement of those in affected areas remains incomplete. The Government of Belarus' plans to construct by 2017-2018 a 2.4-megawatt nuclear power plant near the border with Lithuania (approximately 50 km from its capital city Vilnius) triggered environment concerns in both countries. The Belarusian Government dismissed these concerns and in late 2011 signed a deal with the Russian Government for a $10 billion loan to construct a Russian-made nuclear power plant. As a Russian condition, a 50-50 joint venture was established to sell the nuclear power plant-generated electricity to domestic and foreign consumers. The United States continues to support Belarus' adherence to arms control agreements and treaties into which it has previously entered, including the Open Skies Treaty, which Belarus ratified in 2001. Direct military to military cooperation continues to be minimal. Belarus currently has no International Military Education and Training (IMET) program, and bilateral exercises and cooperation are nonexistent. Belarus has cooperated with the North Atlantic Treaty Organization, through the Partnership for Peace Trust Fund, to destroy a total of 700,000 conventional landmines. Belarus also has a stockpile of over 3 million non-conventional anti-personnel mines, which it had pledged to destroy by March 2008 through an EU-funded project. In addition, there are numerous World War II-era minefields still in place that kill or injure several Belarusians every year. The Ministry of Defense is experiencing success in the area of military reform. Planned changes include combining the Air and Air Defense Forces, downsizing the force structure about 30% from 83,000 to 60,000, transitioning from a conscript to a contract force, and modernizing the command and control structure by creating a Ground Forces Command between the Ministry of Defense and the units in the field. Implementation of these reforms will take an unspecified amount of time. There have been numerous reports of Belarusian sales or delivery of weapons or weapons-related technologies to states of concern, including state sponsors of terrorism. In April and September 2004, the United States imposed sanctions for a period of 2 years on a Belarusian entity, Belvneshpromservice, pursuant to the Iran Nonproliferation Act of 2000 for the transfer to Iran of items on a multilateral export control list, or items having the potential of making a material contribution to weapons of mass destruction (WMD), or cruise or ballistic missile systems. The sanctions against Belvneshpromservice expired in April 2006. In December 2011, the U.S. Government re-imposed sanctions on Belvneshpromservice as it had re-engaged in transfer activities in violation of the Iran Nonproliferation Act. In March 2011, the United States sanctioned Belarusneft, a state-owned Belarusian energy company, for its involvement in the Iranian petroleum sector, which — as UN Security Council Resolution 1929 recognized — Iran uses to fund its proliferation activities, as well as to mask procurement for the importation of dual-use items. In May 2011, the United States imposed sanctions for a period of 2 years on a Belarusian entity, BelTechExport, pursuant to the Iran, North Korea, and Syria Nonproliferation Act (INKSNA). Sanctions were imposed on BelTechExport because there was credible information indicating that it had transferred to Iran, North Korea, or Syria equipment and technology listed on multilateral export control lists or otherwise having the potential to make a material contribution to weapons of mass destruction, or cruise or ballistic missile systems. Under an arrangement with the former U.S.S.R., Belarus was an original member of the United Nations. It also is a member of the Commonwealth of Independent States (CIS - a group of 12 former Soviet republics), the Belarusian and Russian Union State, the Customs Union (CU) and its successor, the Single Economic Space (SES) with Russia and Kazakhstan, the Eurasian Economic Community (EurAsEC), the Collective Security Treaty Organization (CSTO), the Organization for Security and Cooperation in Europe (OSCE), the North Atlantic Treaty Organization's (NATO) Partnership for Peace, the North Atlantic Cooperation Council, the Non-Aligned Movement, the International Organization for Migration (IOM), the International Monetary Fund, and the World Bank. Following the recognition of Belarus as an independent state in December 1991 by the European Community, EU-Belarus relations initially experienced a steady progression. The signing of the Partnership and Cooperation Agreement (PCA) in 1995 signaled a commitment to political, economic, and trade cooperation. Significant assistance was provided to Belarus within the framework of the TACIS technical assistance program and also through various aid programs and loans. However, progress in EU-Belarus relations stalled in 1996 after serious setbacks in the development of democracy. The EU did not recognize the 1996 constitution that replaced the 1994 constitution. Neither the PCA nor its trade-related elements were implemented, and Belarus was not invited to join the EU's Neighborhood Policy. Belarusian membership in the Council of Europe was not supported, bilateral relations at the ministerial level were suspended, and EU technical assistance programs were frozen. In 1998, relations were further worsened when Lukashenka evicted several western ambassadors from their homes in the Drozdy area of Minsk, including the United States Ambassador. In 2004, the Council of Europe adopted a report written by special rapporteur Christos Pourgourides calling on Belarusian authorities to suspend various high-level officials after conducting a thorough investigation of the cases of several prominent Belarusian political figures who disappeared and remain unaccounted for. In line with the U.S., the EU spoke strongly against the government's conduct of the 2006 election, noting that additional restrictive measures would be imposed against those officials responsible for abuses. After the election, the U.S. and EU imposed travel restrictions and asset bans against those responsible for abuses. The EU also launched a 2-year, 2 million Euro ($2.4 million) project to support Belarusian access to independent information, complementing U.S. assistance programs. After the September 2008 parliamentary elections, the EU issued a statement expressing its concern about the conduct of the elections, which, despite limited progress, did not correspond to the OSCE's democratic standards. In response to Belarus' release of the political prisoners it held, the EU in October 2008 suspended for 6 months its visa sanctions on numerous Belarusian officials, including Lukashenka; this suspension was extended until December 2010. In May 2009, the EU launched its Eastern Partnership Initiative (EaP) for Armenia, Azerbaijan, Belarus, Georgia, Moldova, and Ukraine. The EaP's ultimate aim is to forge closer ties between the six target countries and the EU, while promoting democratic and market reforms. However, Belarus downplayed the democracy and human rights aspect of the Eastern Partnership; in September 2011, the Government of Belarus walked out of the annual EaP conference in Warsaw. Russia is the single largest partner for Belarus in the economic and political fields. One-third of all Belarusian exports go to Russia, including the vast majority of industrial goods — such as tractors, buses, and trucks — and dairy and meat products. Due to the structure of Belarusian industry, Belarus relies heavily on other CIS countries, and Russia in particular, both for export markets and for the supply of raw materials, subsidized energy, and components. The framework for the Russia-Belarusian "Union State" was set out in the Treaty on the Formation of a Community of Russia and Belarus (1996), the Treaty on Russia-Belarus Union, the Union Charter (1997), and the Treaty of the Formation of a Union State (1999). The integration treaties contain commitments to monetary union, equal rights, single citizenship, and a common foreign and defense policy. They also have established a range of institutions modeled after the EU. With the exception of isolated progress, such as unification of the two countries' customs duties in March 2001, the Union State has not moved forward. Belarus, Russia, and Kazakhstan signed on October 6, 2007 an agreement to establish a Customs Union. The CU was launched on July 6, 2010 after the customs code of the CU came into effect. On July 1, 2011, customs clearance among the three countries was terminated and was moved to the outer borders of the CU member states. On December 9, 2010, Russia, Belarus, and Kazakhstan signed 17 agreements on the establishment of the Single Economic Space, which came into effect on January 1, 2012. Its member states claim that the SES was established in compliance with World Trade Organization (WTO) norms, which will take precedence over SES obligations, and ensure a free flow of goods, capital, and labor among Russia, Belarus, and Kazakhstan. However, due to Russia's 2012 WTO accession, Belarus, which is not a WTO member, faces competition from cheap, world-class goods that will enter Russia through the WTO and from there to Belarus. Belarus will not have the same preferential access to WTO markets as Russia. The United States recognized Belarusian independence on December 25, 1991. After the two countries established diplomatic relations, the U.S. Embassy in Minsk was officially opened on January 31, 1992. The two countries exchanged top-level official visits in the early years of independence. Stanislau Shushkevich, the head of state as the Chairman of the Supreme Soviet of the Republic of Belarus, met with President Bill Clinton in Washington in July 1992, and President Clinton visited Belarus in January 1994. After this high point, bilateral relations cooled following the election of Lukashenka as President in July 1994. Ambassador David H. Swartz, the first Ambassador to Belarus, officially assumed post on August 25, 1992, the first anniversary of Belarusian independence, and departed post on completion of his term in late January 1994. On November 7, 1994, Ambassador Kenneth S. Yalowitz assumed post. He was succeeded by Ambassador Daniel V. Speckhard, who served from August 1997 to August 2000, but spent 1 year in Washington after the Government of Belarus confiscated his diplomatic residence, along with those of other ambassadors. Michael G. Kozak served as U.S. Ambassador from October 2000 to August 2003. George A. Krol served as U.S. Ambassador from September 2003 to July 2006. Karen B. Stewart replaced Ambassador Krol as U.S. Ambassador and arrived in Belarus on September 18, 2006. Ambassador Stewart was recalled on March 12, 2008 following a threat of expulsion by the Belarusian authorities and the voluntary recall of Belarus' Ambassador to the U.S. Belarus then unilaterally reduced the staff at its U.S. missions, excluding the mission to the UN, to five persons and demanded the U.S. reciprocate by reducing the U.S. Embassy in Minsk from 35 to five diplomats. When the U.S. refused to comply, the Belarusian authorities expelled the U.S. diplomats and capped the presence of American diplomats, stationed or visiting for technical or administrative support, at five. American diplomats are also now required to schedule all meetings with government, state institutions, and state enterprise — approximately 80% of society works for the state — via the Foreign Ministry (MFA). The MFA also requires 24-hour pre-notification before American diplomats travel outside of a 40-kilometer ring outside Minsk. In response, the U.S. applied reciprocal policy on Belarusians working in the U.S., with the caveat that the U.S. will lift the restrictions when the Government of Belarus does the same. The United States and Belarus are currently represented at the level of Charge d'Affaires. In September 1995, three hot air balloons participating in the Coupe Gordon Bennett race entered Belarusian air space. Race organizers had informed the Belarusian authorities about the race in May, and flight plans had been filed. Nevertheless, the Belarusian air force shot down one balloon, killing two American citizens, and forced the other two to land. The crews of the other two balloons were fined for entering Belarus without a visa and released. To date, Belarus has not apologized or offered compensation for these killings. In November 1996, the Lukashenka regime conducted an internationally unrecognized and highly flawed constitutional referendum, which resulted in the dissolution of Belarus' legitimate parliament and the centralization of power in the executive branch through the destruction of the separation of powers. In addition, Lukashenka used his newly centralized power to repress human rights throughout the country, including persecuting members of the illegally disbanded Belarusian Parliament (13th Supreme Soviet) and former members of his own government. As a result of these events and tendencies, the United States announced in 1997 its decision to pursue a "selective engagement" policy with the Belarusian authorities. This policy included downgrading government-to-government contacts to the level of Assistant Secretary and below, as well as restricting U.S. Government assistance to the Belarusian authorities, with some exceptions including humanitarian assistance and exchange programs with state-run educational institutions. At the same time, the U.S. greatly expanded contacts with Belarusian civil society to promote democratization in Belarus. Since 1997, despite U.S. engagement with Belarusian society, official bilateral relations have remained at a low level. In 1998, the Belarusian authorities provoked a diplomatic crisis by demanding and, in contravention of international law, eventually confiscating diplomatic residences in the Drozdy housing compound, including the U.S. Ambassador's residence. This action led the United States and other countries to withdraw their ambassadors from Belarus until the Belarusian authorities provided compensation and guarantees of respect for international law. In 2003, the United States, in tandem with the European Union, proposed a step-by-step, gradual approach to improve bilateral relations: the United States would respond positively to genuine efforts by Belarusian authorities to improve Belarus' human rights and electoral practices. Belarusian authorities failed to take the steps that warranted a positive response. In October 2004, the U.S. Congress passed, and President George W. Bush signed, the Belarus Democracy Act, which was designed to promote democratization. In signing the act, President Bush noted that the authorities were turning Belarus into "a regime of repression in the heart of Europe," and set out the U.S. policy of working "with our allies and partners to assist those seeking to return Belarus to its rightful place among the Euro-Atlantic community of democracies." After a deeply flawed presidential election in March 2006, the U.S., acting with the EU, imposed travel restrictions and targeted financial sanctions against Belarusian officials implicated in human rights abuses and election fraud. The financial sanctions prohibited U.S. persons from engaging in financial transactions with named persons. On January 12, 2007, President Bush signed the Belarus Democracy Reauthorization Act, which repeated the call for targeted sanctions against Belarusian officials and continued assistance for democracy building activities. In August 2007, the U.S. widened application of travel restrictions on Belarusians to include directors and deputy directors of state enterprises. In November 2007, the Treasury Department froze the U.S. assets of the Belarusian state oil and petrochemicals company, Belneftekhim, because of Lukashenka's control of the company. After the Belarusian authorities released the last of its political prisoners in August 2008, the U.S. suspended sanctions for 6 months on two Belneftekhim subsidiaries, Lakokraska and Polotsk Steklovolokno, while keeping sanctions in place against Belneftekhim as a whole. In August 2009, Assistant Secretary of State Philip H. Gordon traveled to Belarus for meetings with government officials on improving bilateral relations on the basis of improved respect for human rights and democratic principles in Belarus. The Belarusian authorities failed to take any steps in this direction; moreover, following the December 2010 elections, they launched an unprecedented crackdown that represented a serious step backward in democratic development. In response to the December 2010 crackdown, the United States in January 2011 announced additional travel restrictions and the re-imposition of sanctions suspended in 2008 against two Belneftekhim subsidiaries. On the same day, the EU announced its own sanctions regime of travel bans and asset freezes. In August 2011, the United States imposed additional sanctions against four major Belarusian state-owned enterprises that were determined to be owned or controlled by Belneftekhim. On January 3, 2012, President Barack Obama signed into law the Belarus Democracy and Human Rights Act of 2011, which strengthened and expanded the Belarus Democracy Act of 2004 and the Belarus Democracy Reauthorization Act of 2006. The law affirms U.S. Belarus policy as calling for new presidential and parliamentary elections that comply with OSCE standards and for the release and rehabilitation of all political prisoners; includes an expansion of the criteria for Belarusian officials subject to visa restrictions and financial sanctions to those involved in post-election crackdowns; and calls on the International Ice Hockey Federation to suspend plans to hold the 2014 International World Ice Hockey championship in Minsk. The U.S. Government continues to support the development of the private sector in Belarus and its transition to a free-market economy. Under the Lukashenka regime, Belarusian authorities have pursued a generally hostile policy toward the private sector and have refused to initiate the basic economic reforms necessary to create a market-based economy. Most of the Belarusian economy remains under government control. The United States has encouraged Belarus to adhere to agreements with the International Monetary Fund (IMF) on macroeconomic stabilization and related reform measures, as well as to undertake increased privatization and to create a favorable climate for business and investment. An Overseas Private Investment Corporation agreement was signed in June 1992, but it has been suspended since 1995 because Belarus did not fulfill its obligations under the agreement. Belarus is eligible for Export-Import Bank short-term financing insurance for U.S. investments, but because of the adverse business climate, no projects have been initiated. The IMF granted Belarus standby credit in September 1995, but Belarus fell off the program and did not receive the second tranche of funding, which had been scheduled for regular intervals throughout 1996. Belarus agreed to a stand-by arrangement with the IMF in 2008 (which was approved by the IMF in January 2009) and concluded the program in April 2010. In 2011, Belarus sought IMF assistance to deal with its ongoing economic crisis but was rebuffed by the IMF. In an October 17, 2011 public release the IMF stated that Belarus would need "to demonstrate a clear commitment — including at the highest level — to stability and reform and to reflect this commitment in their actions" before negotiations could begin. The U.S. Government currently does not encourage U.S. companies to invest in Belarus. Belarus' opaque legal and regulatory systems do not create a business environment the U.S. Government recommends for investment. The majority of U.S. Government assistance programs in Belarus aim to create space for the free expression of political views, advance human rights, support civil society development, and promote media freedom. Other programs strengthen entrepreneurs and business associations, support access to independent higher education, improve living standards through health projects and those addressing vulnerable populations, and combat trafficking in persons. With very limited exceptions, including humanitarian assistance and exchange programs involving state-run educational institutions, U.S. assistance is not channeled through the Government of Belarus. In 2011, the U.S. provided $18 million in assistance to Belarusian civil society, including $4 million committed at an international donor conference in Warsaw. U.S. Government assistance to Belarus peaked in 1994 at approximately $76 million (consisting of more than $16 million in FREEDOM Support Act funds and some $60 million in funds from various U.S. Government agencies). However, U.S. assistance levels dropped sharply due to the lack of progress in democratic and economic reforms after Lukashenka came to power in mid-1994. Belarus was previously a recipient of assistance under the U.S. Defense Department's Cooperative Threat Reduction (CTR) Program, whose objective is to reduce the threat posed to the United States by weapons of mass destruction remaining on the territory of the former Soviet Union by promoting denuclearization and demilitarization and preventing weapons proliferation. However, in February 1997, due to the Belarusian authorities' poor record on human rights, President Clinton de-certified Belarus, thus rendering the country ineligible for further CTR assistance and placing restrictions on other security-related assistance as well. The United States and Belarus signed a government-to-government umbrella agreement on CTR assistance in 1992, seven agency-to-agency CTR implementing agreements, and one memorandum of understanding and cooperation. The umbrella agreement was extended for 1 year in October 1997 but has now expired. For more detailed information on U.S. Government assistance to Belarus, please see the annual reports (http://www.state.gov/p/eur/ace/) to Congress on U.S. Government Assistance to and Cooperative Activities with Eurasia, which are available in the Bureau of European and Eurasian Affairs section on the State Department's website. The U.S. Embassy (http://minsk.usembassy.gov/) in Minsk, Belarus is located at Starovilenskaya 46; tel: (375-17) 210-12-83; fax: (375-17) 234-78-53.